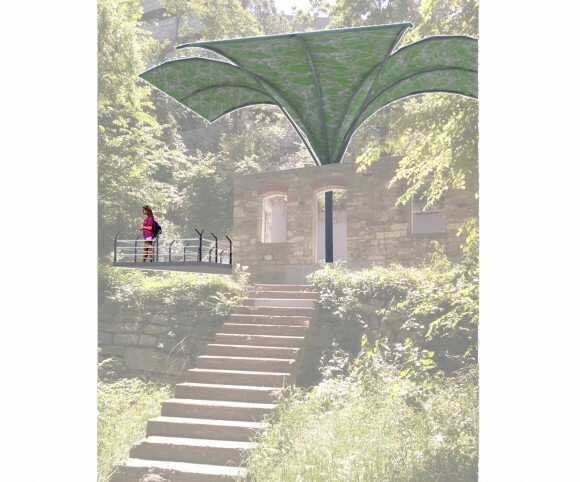 In analysis of the site, there are a series of unfortunate barriers impeding pedestrians from accessing Heritage Park. The Courthouse, City Government Buildings and Paddock Park have a scale that reduces the number of street intersections and thus discourage walkability. The lack of public parking on the north end of downtown further contributes to the difficulty of accessing Heritage Park. 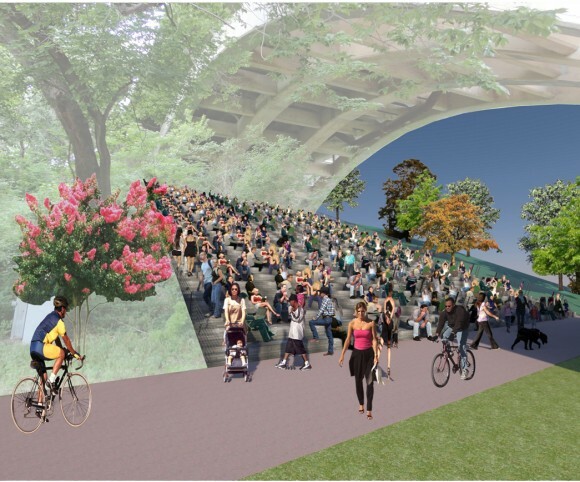 Furthermore, Heritage Plaza must extend to the river that is the life-giving greenway that runs through the city. 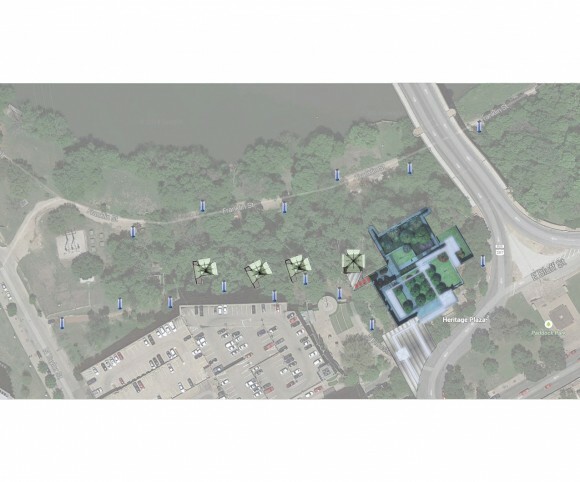 The proposed site plan unifies Heritage Plaza by adding connective tissue between the disparate attractions. 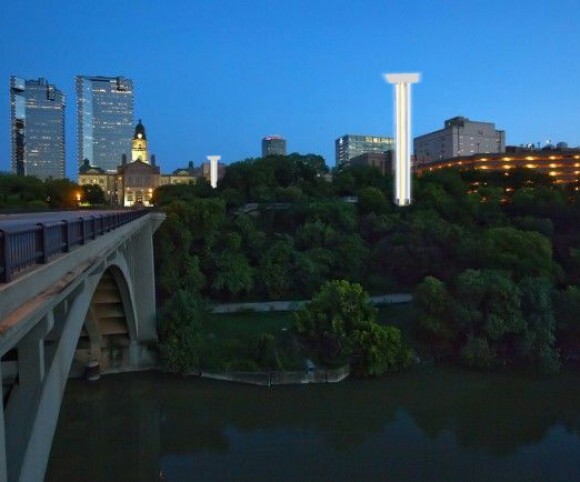 As drivers, bikers and pedestrians enter downtown via the Paddock Viaduct they are greeted by a light tower marking the birthplace of Fort Worth. As pedestrians look north along Houston Avenue, the axis culminates in an active plaza that gives HPP the duality that it so desperately needs, a beacon for attraction. 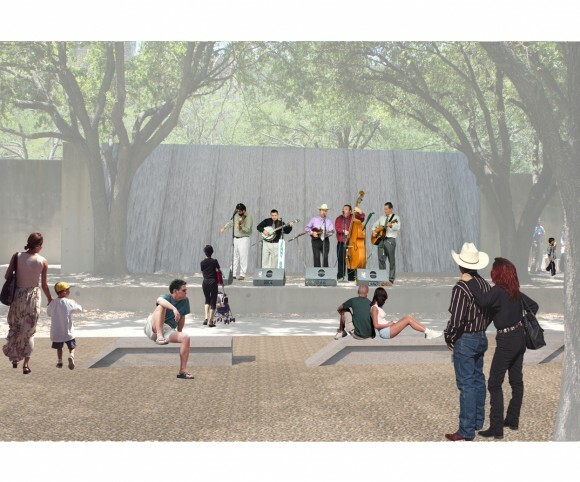 La Corte Barrio and Lower Heritage become a connected trail system with wayfinding, view platforms, shade structures and a historic narrative that feed visitors with a sense of the history and place of Fort Worth. 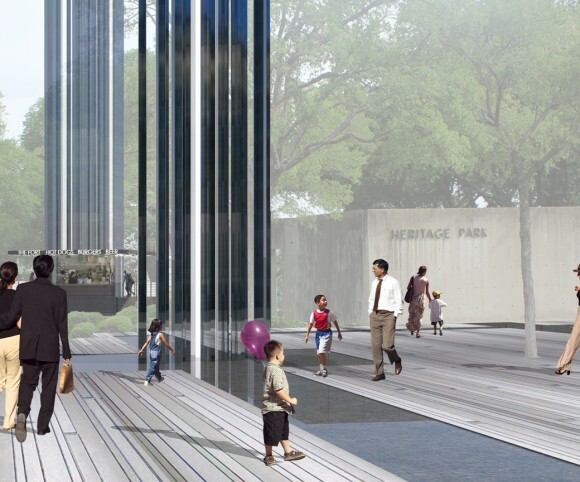 Water, landscape and light are central to the concept and plan to unify Heritage Plaza. Water is paramount in Halprin’s Design. 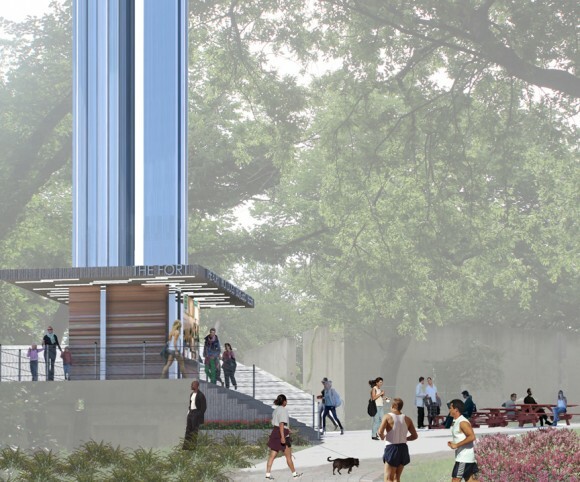 The proposed entry plaza would introduce a new shallow runnel that utilizes reclaimed rain water from the umbrella shaped spire that marks the center of the original parade ground. This runnel would run dry when the reclaimed water runs out, bringing an environmental awareness to the plaza. The landscape is divided into alternating zones of controlled and natural plantings. The water’s edge is a controlled landscape as a buffer to the river and floodway. The natural landscape between the Park and the trails must be reinforced with natural grasses and groundcovers assist in erosion control. Heritage Park itself is in need of new landscape and permeable paving surfaces. The main lawn is proposed to have a crushed granite surface beneath the large live oaks. 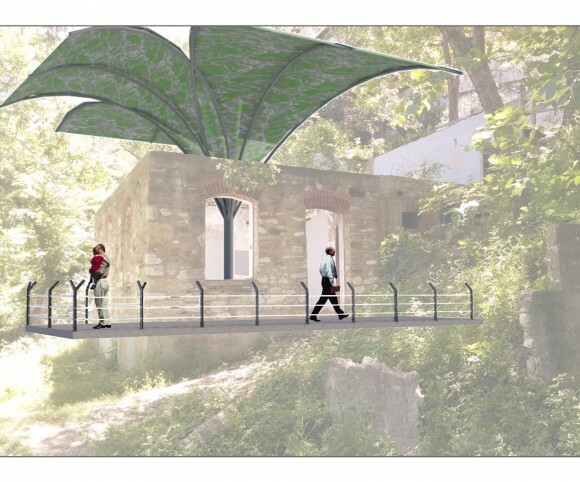 Site furnishings will give the park the ability to be used for multiple purposes. The lower lawns should be re-sod with native drought resistant groundcover that will not require irrigation. The proposed lighting scheme is one of restoration and addition. 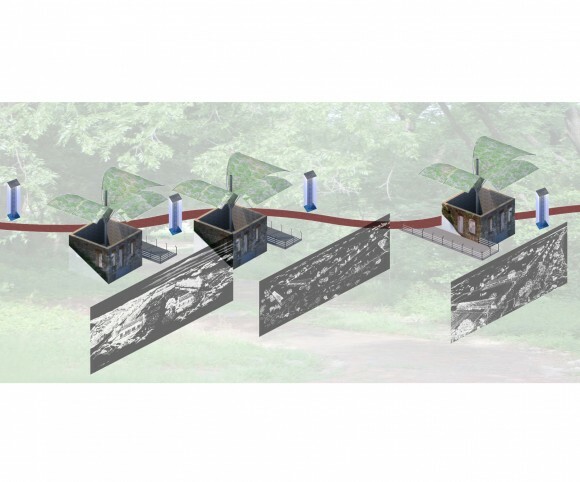 Halprin’s lighting scheme is integrated into the design of the park and ideally should be returned to working order. 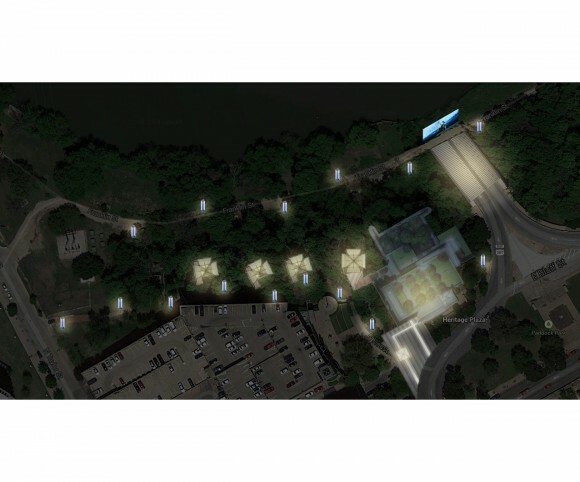 The additive lighting scheme includes two lit towers that serve as beacons and provide light spill throughout the Plaza. 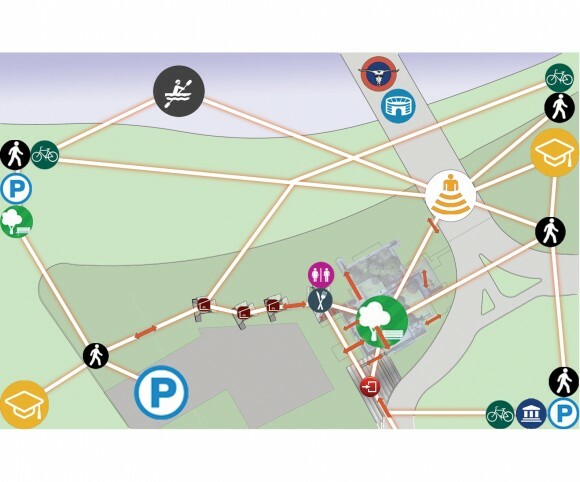 A system of smaller wayfinding light towers are sprinkled throughout to provide safety lighting as well as to mark important or historical facts, views or elements. Heritage Plaza is a unique response to place and history, and is one worth saving. However it can not survive in its current configuration.